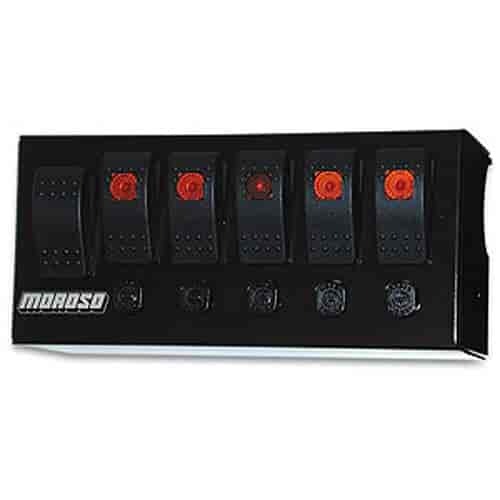 Rated at 20 amps, switches are lighted, single-pole, single-throw, and water & dust resistant. With the driver in mind, a wide profile enables easy operation even when wearing race gloves. Fuses aren't needed thanks to resettable circuit breakers for simple reactivation while driving (except 4-switch panel). Flat surface mount except 710-74190. Fiber panels feature a carbon fiber-like finish. Switch labels/decals included. Do you sell the cage-mount rocker switch panel without the switches? The panel is not available without the switches.